Pants Bank & Margi’s Trip to Uganda – an update! 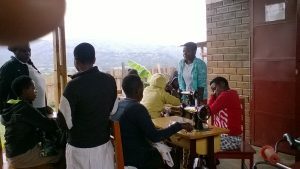 I recently spent 2 weeks in Kabale, SW Uganda visiting friends from Kent who have founded a charity ‘Alongside Africa’ which is focused on turning around the lives of street children of all ages.I took out with me dozens of pairs of pants for boys and girls, donated very kindly by All Saints. The charity currently supports about 50 ex-street children who are now able to attend school (mainly through UK sponsors giving £25 a month per child). There is a drop-in centre open daily giving a safe space where they can go in the holidays to be fed and cared for as well as being the first place of contact for other street children to begin to move back into receiving care and support. 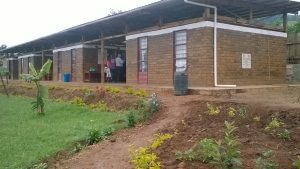 When I arrived it was during the school holidays and 30-40 children were at the drop in each day. Term then restarted and pants were being gratefully distributed as children returned to their boarding schools! I was awed and inspired at all one couple in their mid-50’s have already done in a few years, with the help of some very skilled dedicated local Ugandans and it was a privilege to be a tiny part of their work for a short time. Thank you again for all who supported this project in any way.